My movie review of The Hitman’s Bodyguard starring Ryan Reynolds, Samuel L. Jackson, Salma Hayek, and French actress Elodie Yung is now live over at the Independent Institute. This was a fun movie, an entertaining mix of parody, stylized action, and wise-cracking dialogue. Reynolds and Jackson have great on-screen chemistry. The Hitman’s Bodyguard is an action/drama that would normally be considered standard fare for the summer season. Yet this movie does more than careen through dead bodies and extended vehicle chases. The story is driven by the relationship between the core characters and turns on a serious question of ethics and forgiveness. At the same time, the film verges on a parody of its genre. This combination seems to have befuddled many movie critics but not audiences. Based on my movie scoring, I gave The Hitman’s Bodyguard an A. This is substantially higher than conventional critics who seemed to pan it for the cliched plot. I actually saw much of the action as parody and felt the humor offset the seriousness of the heavy ethical and relationship issues that were the center of the relationships between Bryce and Kincaid. The full review goes into these aspects of the film in much greater detail. 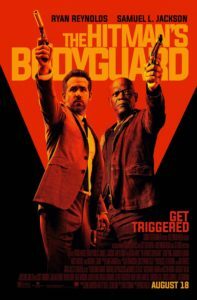 This entry was posted in Film Reviews, Films, Independent Institute and tagged action, movie review, parody, Ryan Reynolds, Samuel L. Jackson, The Hitman's Bodyguard on September 13, 2017 by SR Staley.